I thought committing to a photo update every two weeks would be manageable. It has proved to be more of a struggle than I thought it would be with a one year old to chase and a husband that is working a lot lately. Half of the photos below were taken a week or more after the actual week stated, but I got them documented. I’m not sure how I managed a photo a week and a journal entry with baby #1!?! Now that summer vacation is under way I know I can do better and would like to add in a few more details with future bumpdates. I keep looking back at my pregnancy journal that I made with my weekly chalkboard and pregnancy journal updates from the first time around. 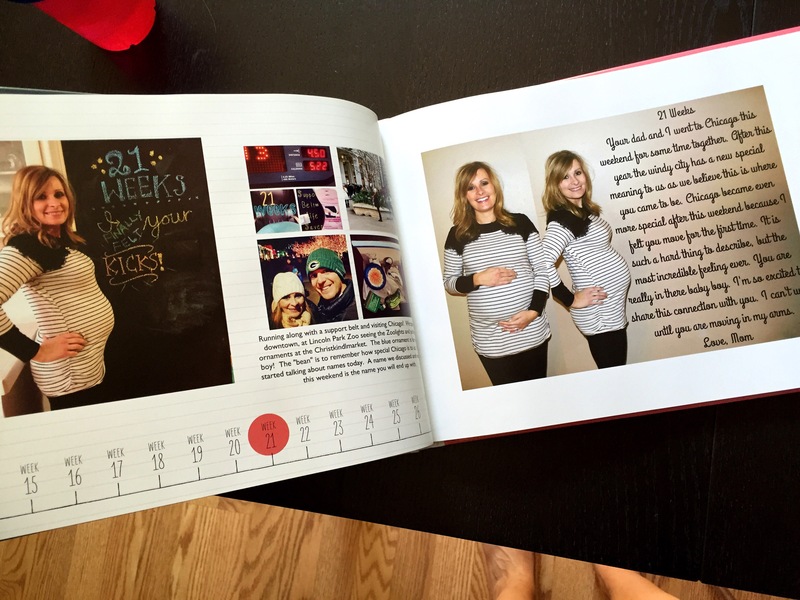 I so love that I documented and made a photo book of my first pregnancy to look back on. So special to me! I would definitely recommend preggo mamas do this even if you don’t ever plan to share it with anyone but yourself. I made mine on Shutterfly. I don’t think I’ve even really showed mine to anyone (well, except if you read this blog you saw the weekly journals) because it really is for me. Here is an update from the first half of my pregnancy with baby #2 so far. Apparently I really like stripes! During the first 14 weeks I suffered from extreme fatigue and evening nausea on a daily basis. I also had lots of headaches and threw up several times (which was only once last time, but I was nauseous off and on frequently). Most the time my headaches felt like the onset of a migraine. I used to get these in high school and they returned after having baby #1. I also had two colds and pink eye for the first time ever. Combine this with being on my own with little man each night after work while the husband was coaching and it was tough. With a busy boy there was no napping or really even sitting for this mama. As for running, my mileage has been all over the place during the first half of pregnancy #2. If I’m being honest, I also hadn’t truly adjusted to balancing it all and working out. I was just starting to get back into a routine with the marathon training I began in February. Plans for running a marathon this spring changed when I found out I was pregnant, but I did manage to run a half marathon at 16 weeks pregnant comfortably. During my first pregnancy that distance didn’t seem possible and my longest run was a 10k race. I would not advise all women to go for this distance (and you should of course talk to your doctor), but since I had already ran 20 half marathons before along with over a dozen marathons and an ultra marathon I felt it to be ok and so did my midwife. So far running has felt much more comfortable with this pregnancy. Last time I seemed to experience a lot more ligament pain and pressure while running. My bladder seemed to never get a break. Maybe it is easier because I’ve done it before and know what to expect, or maybe it is because my muscles are already stretched out or maybe it really is easier this round. Baby girl is positioned very differently compared to her older brother after all. Whatever the reason, I just know I’m really glad I’m enjoying running still (as much as I can when I’m pregnant). I’m planning to track my workouts throughout the rest of my pregnancy on here so I can refer back to them should I need to in the future and to hold myself accountable. Social media and the internet are a great way to hold yourself to your goals. It works for me anyway. Stay tuned for biweekly bumpdates and my take on running and being active through pregnancy. Off to do my kegels.